A perk when attending a writing conference: Nametag swag! On April 18, I drove down to Phoenix to attend the Press Publish conference. Bloggers like myself congregated in cool conference rooms merely steps away from palm trees and a breezy 80 degrees. After two years of blogging, I want to take my WordPress skills and klwightman.com to the next level. I always forget the value of attending a writing conference until I’m immersed in the experience. But I don’t want to keep all the lessons I learned at the Press Publish conference to myself. Here’s what I gained from the experience. If the conference has a hashtag, jump into the conversation. Take pictures of the lecture and tweet in real time. Follow conference attendees. Start conversations with them or reply back to their tweets. Favorite or retweet what they have to say. Social media is a great way to break the ice when attending a writing conference. That’s because during class breaks or lunch, you can meet up and introduce yourself to conference attendees without any awkward small talk. Don’t underestimate the power of the tweet. Attending a writing conference without doing some work is like bringing a horse to water and—well, you know the rest. Throughout the conference, I kept a running document called Homework that I updated with new ideas I wanted to implement on my WordPress blog. This week, I plan to break up the tasks into my weekly schedule so that I don’t lose the skills I gained at the Press Publish conference. This one probably isn’t a surprise to you. That’s what attending a writing conference is all about. But the people I met at the conference were to me. Lunch was my opportunity to meet conference attendees. Shaded tables showcased a blue paper centerpiece with words to gather like-minded souls, such as “parenting bloggers” and “SEO” and “new to blogging.” Naturally, I chose the social media table. First, everyone shared their social media experience with the table. Then, I spoke with those who sat next to me. To my right, I chatted with a woman who helped me decide between having a WordPress.com or WordPress.org blog. To my left, I met Angie and discussed potential ways to expand her business—and how I can get involved. Never talk to someone at a conference in hopes to get something out of them. Instead, talk to someone to have the experience of learning their story. That’s how opportunity is created. There’s a lot of information to take in when attending a writing conference. So give yourself a break. It’s okay not to attend every class session. Even if it’s fifteen minutes, step outside and let yourself think. Are the ideas you are excited about now really relevant to your writing project? Are you dismissing an idea for the right—or wrong—reasons? Journal your thoughts or take a walk. By briefly stepping away from the activities, you are allowing your mind to process the information and your feelings about it. I keep an ongoing list on my phone for blog post ideas. That’s because my best ideas come to me when I’m out and about experiencing life. And that’s just what happened while attending this writing conference. The rooms were bursting with creative discussion and outside-of-the-box ideas that I was jotting down future blog post ideas as fast as I was tweeting. Always be ready to take in an idea, evaluate how you can apply it to your writing, then take the next step to its implementation. Be ready for the changes coming to my blog. I know I’m ready. What have you learned by attending a writing conference? Share your experience below. I couldn’t agree with you more. Tweeting the conference helped me keep the ideas straight while allowing for more connections with other bloggers. What a fabulous conference! 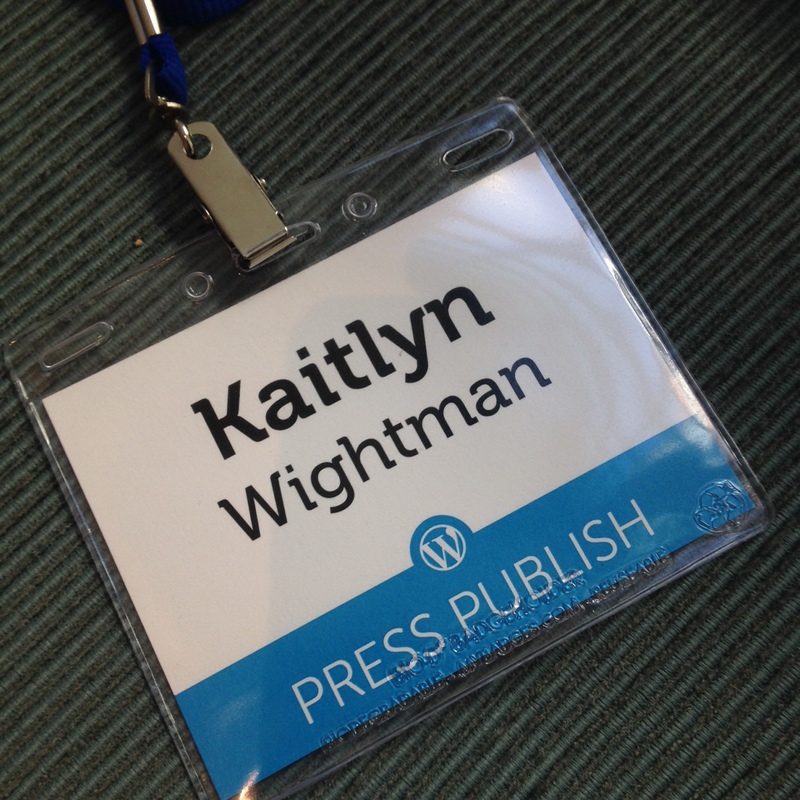 I blogged about my experience here: https://bulgingbuttons.wordpress.com/2015/04/21/press-publish-a-conference-for-bloggers/ . And yes, I do believe we talked at some point during the day! Helpful and thoughtful post, Kaitlyn! I especially appreciate that you wrote, “Never talk to someone at a conference in hopes to get something out of them. Instead, talk to someone to have the experience of learning their story. That’s how opportunity is created.” Letting relationships unfold naturally is a wonderful thing. I’m so glad that we met and look forward to staying connected. Spring baseball is coming to a close soon, bringing much more breathing room to me. Enjoy our gorgeous weather and I look forward to reading more from you.